NOTE: You can also roast a head of garlic instead of using raw in this recipe. Simply cut the top of a head of garlic off, revealing each clove. Drizzle a tiny bit of water over the head, wrap loosely in foil, and roast with the eggplant on the tray at 400 degrees for 1 hour. Squeeze cloves out and into the blender. Pre-heat oven to 400 degrees F. Wash eggplant well and prick it several times on all sides. Place the eggplant on a baking tray on top of a silpat mat or parchment paper. 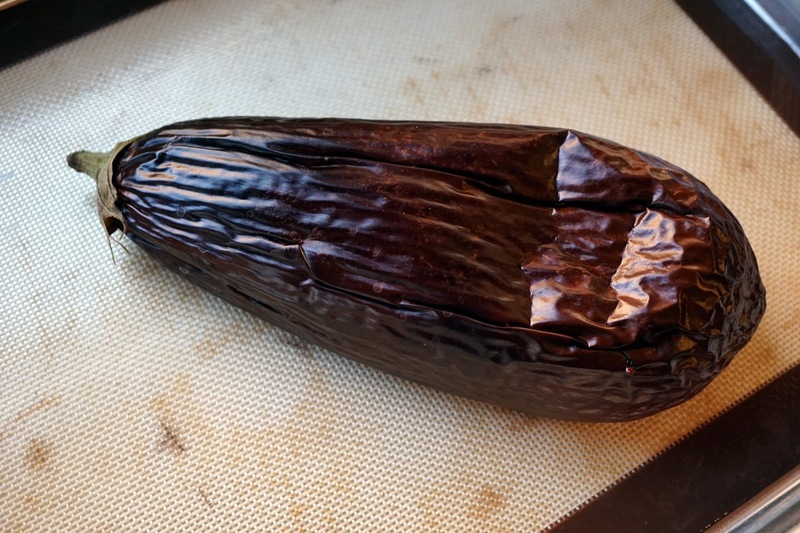 Roast for 1 hour to 1 hour and 15 minutes--until the eggplant begins to implode. Remove the eggplant from oven and cut it open lengthwise to cool. Scrape out the center (including the seeds) and add to your high-speed blender jar. Add all of the rest of the ingredients and only 1 T. of water and blend until VERY smooth. If needed add additional T of water as needed to reach desired consistency. Serve with fresh, raw veggies, baked oil-free lavash crackers (made from Trader Joe's whole wheat lavash bread -- instructions below), or whatever you like to dip into your hummus! Buy Trader's Joe's Whole Wheat Lavash Bread. Cut into small rectangles and bake (no oil!) in the oven at 325 degrees until crispy (8-12 minutes, depending on your oven. Cool.